Remember when rBST-free milk was all the rage? Now, it’s probably harder to find milk with hormones, than not (just a guess). But what about cheese? Or sour cream, cottage cheese and ice cream, for that matter? If we don’t make it from scratch (and some of us don’t, at least not yet), are we assuming that all dairy is hormone free? What got me into this mess was a sale on cheese. I scooped it up, stuck it in the fridge and promptly realized I hadn’t checked the label on a brand I don’t normally purchase. It didn’t say “made from cows not treated with rBST” anywhere. A few minutes of research later and I knew that cheese in the fridge had hormones in it. <gasp> So I made my husband eat it. Fast forward a few years and I loyally only buy one local brand of dairy. It’s hormone free and every milk delivery is tested for antibiotics (all milk, conventional or organic, is tested for specific antibiotics and if positive, cannot be sold). And frankly, it’s just simple buying from one brand that I know is hormone-free and fits in my budget. If you can find a local farmer that you trust and can afford, do it! 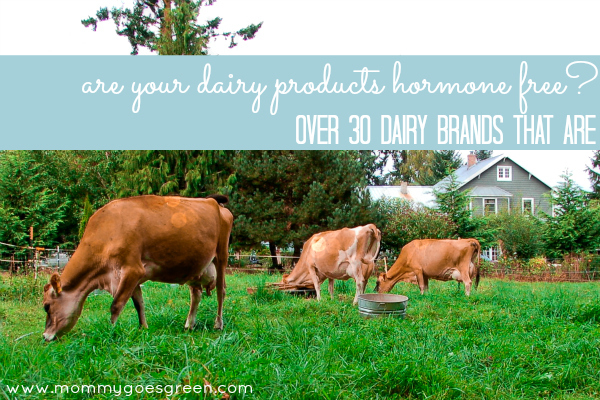 But when that isn’t an option, here are 30 conventional dairy brands that offer hormone free dairy products that you might find at your local grocery store. If an online policy is available, I’ve linked to it, otherwise I obtained the information through emails with each company. Note: 100% organic dairy products are always free of milk from cows given rBST so I have not included them in my list of 30 conventional brands. Here’s just a few of the brands that responded to my inquiry that had a variety of responses basically stating that their products are not guaranteed to be free of milk from cows treated with rBST: Breyer’s, Blue Bunny, Borden, Sargento, Dreyer’s, Frigo, Haagen-Dazs, Hilmar Cheese, Land O’Lakes, Philadelphia, Walmart (milk is free of rBST but not other Walmart branded dairy products) and Publix (milk is free of rBST but other Publix branded dairy products). Want to save this list for grocery shopping? 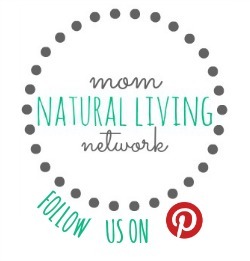 Save it to Evernote or Pin the post to your Pinterest boards or Save to Pocket! Let’s grow this list! What brands do you commonly purchase? Thanks for a very helpful list! I now get organic raw milk directly from the farmer, and make my own kefir from that, but hadn’t thought of cheeses and such! Thank you for this list. I love the Tillamook cheese, did not know it was hormone free. I quite buying it because it is not labeled. Actually had one company (no names) tell me they doubted that I could purchase any cheese that was hormone free. Ick. I’m confused about kroger. Does that mean all of their dairy products are hormone free? Hi Heather, most Kroger branded dairy products are hormone free but not any brand carried at Kroger. If it is a Kroger branded dairy product that contains whey, buttermilk or whey protein concentrate, it may not be 100% hormone free as “they are still sourcing rBST free dairy powders”. For example, the Krogram brand milk is hormone free because it is 1) Kroger brand and 2) does not contain any dairy powders. Does that help? Hi was just wondering about Meijer milk? We recently tried Promised Land 2 percent milk – it is phenomenal and claims to be hormone free. I am searching for butter and cheese that is also hormone free. I did find chicken at Sam’s, raw, hormone and antibiotic free so we’ll be buying that in the future. Also picked up some very reasonable price hamburger and bacon at Braum’s. All their Braum’s labeled products are hormone free. It’s really hard to change habits- I shop at Sam’s a lot and a local butcher shop – the cows are grain fed and the meat fantastic, however it does have hormones in it. The last Kroger Milk label we read said their farmers “Pledge” not to use rBST. Is that a guarantee or certified to be hormone-free? Talking with customer service, Kroger butter is not guaranteed to be rBST free. Thank you for the list. Can you tell me why companies like Daisy do not print the hormone free status on their labels? Ralph’s grocery stores (West coast) assure me that ALL their milk and cream are rBST free, so their Ralph’s brand name products are also hormone free. Thank you for this list…however, I notice you list DAISY brand…I saw a very disturbing video on Facebook about how they treat their animals at Daisy farms. I will never buy their products again. Does anyone have any information about this? I was relieved to see that Stonyfield Farms and Trader Joe’s milk products are hormone free. What about Lowe’s Foods brands? I see Kerrygold butter on the list, but I don’t see Kerrygold cheese. Also, when I click on the “policy” link beside it, there’s nothing there. Do you know if all Kerrygold products are hormone-free? Do NOT trust Whole Foods. They are now owned by Monsanto. Great value from Walmart, Starbucks drinks and Panara Bread all have rBGH free milk products! Please forgive me as I see no other concerns posted like mine. My late husband and I waited to have a child til I was nearly 40. In the last month I have noticed our 10 and a half year old is beginning to develop up top. I found this surprising since she is so young. It donned on me tonight that it might be the dairy products I buy. We eat very little meat and wouldn’t know if it was hormone free. We do use a lot of dairy for our protein. After more thorough research on Land of Lakes butter I have found the following link concerning whether they produce their butter via cows treated with rBST. Bottom line is they do not use dairy cows treated with the rBST hormone. Here is the link. No where on “ANY” Kroger cheese label does it read: RBST FREE , NONE ; I called Kroger 800 Number shown on the cheese label and the Kroger Representative that answered My call “Didn’t Know the answer”” ,so after doing some checking with other people in her office , she advised Me : “Kroger dose not Guarantee their Cheese to be RBST Free”. SO , I Stopped Buying ALL Kroger Dairy Products , except occasional Milk ; SAME goes for SAFEWAY BRAND Cheese & Dairy Products , NO Guarantee to be RBST Free , NONE . I just called Costco, Kroger & Walmart. Kroger & Walmart brand milk ARE RBST free. Neither of them can guarantee their cheese is. Kroger did say that if you can find their “Simple Truth” brand in dairy it should be RBST free because that is their organic brand. Costco said there is a less than 1% probability their shredded cheddar is not RBST free, but they still can’t guarantee. I didn’t ask about their milk.